Description : This Note Case is crafted out of beautifull Cow and Buff leathers. 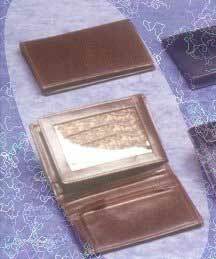 It has two deep note compartments, nine card slots, three side pockets and a mesh window for the driving license. Coins can be kept in zip pockets on the right hand side.